Keeping Hope Alive was privileged to go to South Sudan just this last May of 2013. We were absolutely amazed by the accomplishments of our dear friends and missionaries there: Brad and Kim Campbell. Brad and Kim have been working tirelessly in Malakal, Sudan. They have started an orphanage of 7 children (whom they consider their own! ), have started an English school for 50 local children, and have a weekly church meeting in the front yard of their compound. The Campbell's are well respected by the community in South Sudan, and have made many good relationships and friendships there. Keeping Hope Alive is now partnering with the Campbell's, their orphanage and their other ministry projects and work there in the South Sudan. 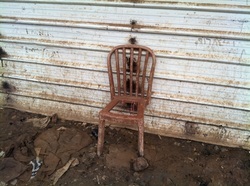 My heart was really broken when I saw this chair in the South Sudan market. A picture is worth a thousand words and, to me, this chair represents the history of South Sudan. South Sudan has been through 50 long years of civil war within its own nation. In this war, 2.5 million people have been died, and millions of people have been displaced out of their homes. Like this chair, despite the cruelties of years of civil war and death, South Sudan still stands. It has now dedicated its nation to Jesus and gives God all the glory for helping them to stand and survive the war. In this picture, there are bullet holes in the wall, a man's clothes fallen on the ground, but the nation of South Sudan says, "No more. We're standing, and we will be a nation." As of July 9th, 2011, South Sudan was born as a new nation, free of war. It is now a democratic nation which has changed its language from Arabic to English in the schools. In ten years time, this nation will be considered one of the greatest nations in Africa, because they give God the glory and honor all of the people who have given their lives to see freedom in this land.